Another police killing of an unarmed man of color. Another grand jury deciding not to indict: Not for murder. Not for manslaughter. Not for assault. Not even for reckless endangerment. We live in a land of impunity. At least, for those in power. This past summer, after covering the protests in Ferguson, Mo., I flew back to New York City and went straight to Staten Island to cover the march protesting the police killing of Eric Garner, a 43-year-old African-American father of six. This story was strikingly similar to the police killing in Ferguson, where Officer Darren Wilson gunned down unarmed African-American teenager Michael Brown. Both cases involved white police officers using deadly force. Both of the victims were unarmed African-Americans. In both cases, local prosecutors, with close ties to their local police departments, were allowed to control the grand jury. There were some differences between the cases. Most notably, Eric Garner’s killing was captured on video. If you look at the video closely, just as NYPD Officer Daniel Pantaleo puts him in an illegal chokehold, you see Eric Garner put his hands up, the international signal of surrender. He is then taken down by a gang of police officers. You hear him repeatedly say, “I can’t breathe!” He says it a total of 11 times before he goes limp and dies. Where did this video come from? A young man named Ramsey Orta was standing near Garner on that July 17 afternoon when the police moved in. Orta flipped open his cellphone and videoed the whole thing. Pantaleo was caught red-handed. The evidence was there for everyone to see. Well, the grand jury decided not to indict Pantaleo. Only two people were arrested in the wake of Garner’s death: Ramsey Orta, who shot the video, and his wife, Chrissie Ortiz. Chrissie told a local television station that since Ramsey was identified as the videographer, they had been subjected to police harassment. Ramsey was arrested the day after the city medical examiner declared Garner’s death a homicide. Chrissie was later arrested as well. I saw them at the Staten Island march that Saturday, standing near where Garner died. I asked them for comment, but they were afraid. They huddled on the same stoop that Ramsey was on when he filmed Garner’s death. 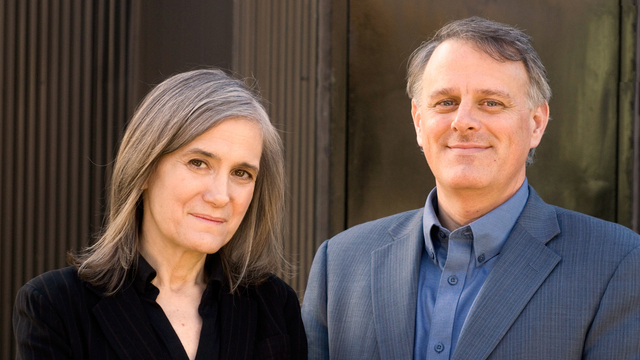 Click here to listen to Amy Goodman’s podcast. Subscribe to her weekly podcast on SoundCloud and Stitcher Radio.